1. Easy Slider no need to install modules, just need to create blocks and assign to header region, need to create separate block for each slide. You will be redirected to pay $17.00 via PayPal. 1. Simple and Easy to use,no need to install any modules for header slider. 2. Header Slider Can Be Managed From Admin, Just Need to Create New Blocks and Insert Image Path and Assign It To Header Region, Each Image Need to Have One Separate Block. 1. Can Add/Edit logo, menu items with out editing html files just need to edit widget and add image and item links. 4. Can Add Separate Thumb nail image for homepage and big separate image for item page. 5. Included PSD for customization. 1. 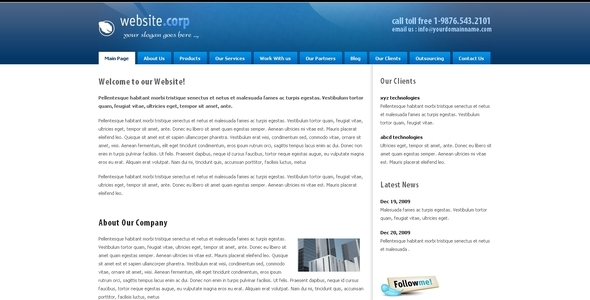 Included js jquery and non-js version with 5 Html pages. Hi guy’s just want to let to know my 4 templates are available for sale at theme forest for less price. Orangeo.sol is an orange flavour template with 2 column, easy to customize and use. 2. Two Column Layout with 2 different aligned varitions ( check about page ) . 3. Layered PSD with well grouped. 2. Home has single column and inner page(about us and elements page ) has 2 column. Layered psd file can be edited easly. Cimple.sol is simple clean template using jquery for loading content for respective page with out navigating or loading complete page. please leave your comments on this templates.